Instant Imprints Burlington, ON | Custom T-Shirts, Embroidery, Signs & More! At Instant Imprints Burlington, our customers come to us when they want to be more visible to their customers. We create that visibility five different ways: Branded Apparel (embroidery), Signs & Banners, Promotional Products, Custom T-Shirts and Print Services. If you’re custom t-shirts, banners, printing services, embroidered apparel or other promotional products, Instant Imprints® Burlington has what you need to bring your business to the next level or make your next event extra special. When you come by our Burlington Center, you’ll be making the best choice you can to step up your brand visibility. We work to make sure your job is done right the first time, on time and with the attention to detail that only a local shop can provide. Our Image Experts can help you make your marketing vision come true, right here in Burlington. Custom t-shirts are one of the most powerful and engaging ways to get your logo out there. You can use custom tees for employee uniforms, put them up for sale or use them for custom giveaways to show your appreciation for special customers.Our Personalized T-Shirt Service combines state-of-the-art shirt printing processes with a personalized attention to detail that fits your specific needs. All of this comes at a competitive value, so you can meet your production goals. Wherever your shirt travels, across Ontario and beyond, it will promote your brand and bring your business visibility to virtually anywhere in the world. Custom signs and banners help build your brand exposure from the streets and skylines. They offer a wide range of materials, sizes and designs, and can be used indoors or outdoors. Banners are durable and effective ways to promote in whatever way is most suitable for your business. They’re a great opportunity to show your creative side! 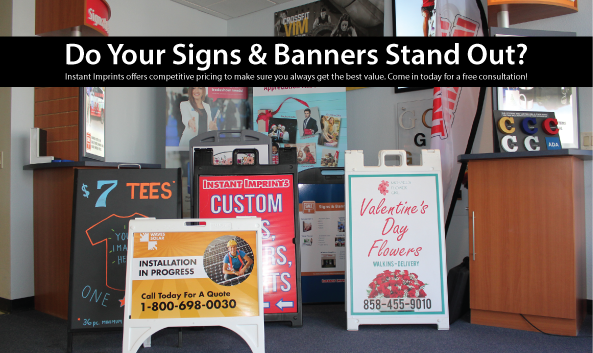 From sidewalk signs to skyscraper saddles, our Burlington store can provide you with any type of banner or sign your business needs. Dream big and stand out with our custom banner service! At your Burlington Instant Imprints, we pride ourselves on having a strong set of core values that drives what we do everyday. We are determined to have your job completed on time or early and get it done right the first time, avoiding the costly revisions you may have to endure with second-rate services or in-office printing. The local, personal touch that our Burlington Center brings means that your specific project needs will be met in a way that you’ll be thrilled about—your brand will have the tools to thrive! When you come by our Instant Imprints Burlington Center, you’ll be taking a big first step to bringing your brand visibility to new heights. By engaging in a one-on-one connection with a local Image Expert, you can get your specific project needs understood and have any questions you have answered. Whatever your promotional needs are, they’ll be handled in a professional and prompt way. Are you wondering, where is an Instant Imprints near me? Stop by our Burlington showroom to see samples of our products at work and get a sense of what your finalized products could look like. By checking out product samples in person, you’ll better understand which fabrics, colors and designs will be best for your project. Stop in today, request a quote online or drop us a line at (905) 637-2828 to take that first step toward a better brand.